Etobicoke (/ɛˈtoʊbɪkoʊ/ ( listen), e-TOH-bi-koh) is an administrative district and former city that makes up the western part of Toronto, Ontario, Canada. Etobicoke was first settled by Europeans in the 1790s; the municipality grew into city status in the 20th century. Several independent villages and towns developed within the area of Etobicoke, only to be absorbed later into Etobicoke during the era of Metro Toronto. Etobicoke was dissolved in 1998, when it was amalgamated with other Metro Toronto municipalities into the City of Toronto. Etobicoke is bordered on the south by Lake Ontario, on the east by the Humber River, on the west by Etobicoke Creek, the city of Mississauga, and Toronto Pearson International Airport (a small portion of the airport extends into Etobicoke), and on the north by Steeles Avenue West. Location of Etobicoke (red) compared to the rest of Toronto. Different groups of First Nations peoples used the land that is now Etobicoke at different times. As the Algonquins gradually moved west from the Atlantic to Lake Erie, it is almost certain that they would have occupied this land at some point. By the time they were mostly settled on the shores of Georgian Bay, the Huron-Wendat were the primary residents of the north shore of Lake Ontario. During the 17th century they were pushed out by the powerful Haudenosaunee (Iroquois) confederacy, made up of nations based to the south of the lake. After continued harassment from the Iroquois to the south, a coalition of the Ojibway, Odawa, and Potawatomi Algonquin nations, known as the Three Fires, gradually pushed the Haudenosaunee off this land. The Algonquian-speaking Mississaugas settled here by 1695, fishing and growing crops more locally in the summer and hunting farther afield in the winter. The name "Etobicoke" was derived from the Mississauga word wah-do-be-kang (wadoopikaang), meaning "place where the alders grow". This was the way they described the area between Etobicoke Creek and the Humber River. The first provincial land surveyor, Augustus Jones, also spelled it as "ato-be-coake." Etobicoke was finally adopted as the official name in 1795 at the direction of Lieutenant Governor John Graves Simcoe. A map depicting the Toronto Purchase in 1787. The inclusion of Etobicoke in the purchase was contested until 2010, when the dispute was settled between the Government of Canada and the Mississaugas. The British officials intended Etobicoke to be included in the Toronto Purchase of 1787. However, the Mississauga and government disagreed as to whether the western boundary of the purchase was the Humber River or the Etobicoke River (now, Etobicoke Creek). The Mississauga Indians allowed British surveyor Alexander Aitkin to survey the disputed land, and the British paid an additional 10 shillings for the purchase, although the purchase was never formally agreed to. The dispute was eventually settled between the Government of Canada and the Mississauga First Nation in 2010. Immigrants from the British Isles were among the new settlers, as well as Loyalists who had left the rebellious Thirteen Colonies, by then the new United States. Early settlers included many of the Queen's Rangers, who were given land in the area by Simcoe to help protect the new capital of Upper Canada and to develop this frontier area. In 1793-95, the Honourable Samuel Smith, a colonel in the Queen's Rangers, received land grants of 1,530 acres (6.2 km2), extending from today's Kipling Avenue to Etobicoke Creek, and north to Bloor Street. The first land patent was issued to Sergeant Patrick Mealey on March 18, 1797, for a plot on the west side of Royal York Road on Lake Ontario. This was part of the First Military Tract, or "Militia Lands", which extended from today's Royal York Road to Kipling Avenue, south from Bloor Street. The Crown was providing land to Loyalists in compensation for property they left behind in the US and to veterans of the American Revolution in payment for service. In other parts of Ontario, the Crown granted land to the Iroquoian First Nations who had served as allies during the war and were forced to cede most of their land in New York to the state. The Crown granted more land to the members of the Queen's Rangers in the First Military tract, but most Rangers did not occupy their land. Many sold their acreage to others after a short time. The census of 1805 counted 84 people in the township of Etobicoke. In 1806, William Cooper built a grist mill and saw mill on the west bank of the Humber river, just south of Dundas Street. The 1809 census counted 137 residents. The Dundas Street bridge opened in 1816, making the township more accessible. John Grubb's House, built in 1832. Grubb helped found the community of Thistletown in present-day Etobicoke. On May 18, 1846, the Albion Road Company was incorporated. 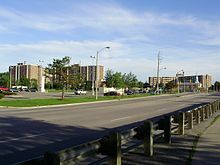 Its purpose was to build and maintain a road to the north-west corner of Etobicoke, where a new community was planned. At the same time, John Grubb, who had already founded Thistletown, hired land surveyor John Stoughton Dennis to plan a community at the intersection of Islington Avenue and Albion Road, to be named Saint Andrew's. Plan 6 for this community was registered on October 15, 1847. The French master of Upper Canada College, Jean du Petit Pont de la Haye, contracted land surveyor James McCallum Jr to create a plan for the community planned by the Albion Road Company, and Plan 28 was registered for Claireville on October 12, 1849. The township of Etobicoke was incorporated on January 1, 1850. The first meeting of the town council was held on January 21. Present at the meeting were reeve William Gamble, vice-reeve W. B. Wadsworth and aldermen Moses Appleby, Thomas Fisher, and John Geddes. The council convened monthly meetings at a variety of places. In 1850, the population of the township was 2904. 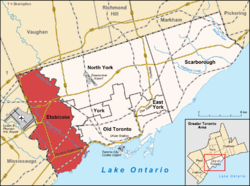 By 1881, the population of Etobicoke township was 2976. In 1911, the community of Mimico was incorporated on land taken from Etobicoke township. New Toronto was incorporated on January 1, 1913. Early on, there was talk of merging Mimico and New Toronto. A 1916 referendum on amalgamating the two communities was approved by the residents of Mimico, but rejected by residents of New Toronto. In 1917, Mimico became a town and in 1920, New Toronto became the Town of New Toronto. Long Branch was incorporated in 1930 as a village. In 1954, Etobicoke Township became a part of the newly formed regional government, the Municipality of Metropolitan Toronto ("Metro"). In 1967, the township of Etobicoke was merged with three small lakeside municipalities — the Village of Long Branch, the Town of New Toronto, and the Town of Mimico — to form the Borough of Etobicoke. The borough was reincorporated as a city in 1984. In 1998, six local municipalities (including Etobicoke) and the Metropolitan Toronto government merged to form the amalgamated city of Toronto. Humber Bay Park is one of several municipal urban parks located in Etobicoke. Etobicoke has the lowest population density of the former cities and boroughs that currently make up the city of Toronto. This is mainly due to its expanses of industrial lands along the various expressways. The residential areas consist primarily of single-family dwellings, although several large multi-storey high-rise condominium developments have been built in south Etobicoke near the Humber River over the past few years. The central areas of Etobicoke are generally middle class. The central and northern areas of Etobicoke contain numerous high-density apartment complexes set in the middle of sizable, open fields and parks. The central/southern areas of Etobicoke, such as Markland Wood, The Kingsway, New Toronto, Mimico and Long Branch, consist of large green spaces, numerous parks, and main street shopping areas. The Kingsway neighbourhood has attracted many affluent individuals and families (as of 2001, over 50% of households have an income in excess of C$100,000/year). Etobicoke has numerous public parks. Notable among them is James Gardens on the banks of the Humber River. The park includes seasonal flowers, walkways, a rock garden, streams, and waterfalls. It is a very popular site for taking wedding photographs. Also located in Etobicoke are Centennial Park, a large recreational park and Colonel Samuel Smith Park and Humber Bay Park on the lakeshore. Etobicoke has numerous golf courses including St. George's Golf and Country Club, which in 2007 was ranked as one of the three best golf courses in Canada. A Neo-Georgian designed home in Mimico. The Lakeshore consists of neighbourhoods that were first to urbanize in Etobicoke. The Lakeshore (Etobicoke—Lakeshore), along the north shore of Lake Ontario and the "Lake Shore Road" (now Lake Shore Boulevard West), comprises three former municipalities that were the first in Etobicoke to urbanize and became separate municipalities during the first half of the 20th century: Mimico, New Toronto and Long Branch, and related communities that were never separate from the Township of Etobicoke; namely, Alderwood (originally a suburb of New Toronto), and Humber Bay (a historic gateway community connecting to Toronto) which was originally sprawl from the east side of the Humber River that was subsequently split by the construction of Ontario's first motor vehicle 'freeway' in 1938, which cuts across the top of southern Etobicoke; (the Queen Elizabeth Way). The original remnant residential (northern) section of Humber Bay today is located north of The Queensway, east of Mimico Creek to the Humber River. The commercial, southern section of Humber Bay today retains only Christie's Biscuits bakery, as high-rise condominium towers and clustered row housing have forced out virtually all other commercial/industrial employment uses. In the late 1990s, the former McGuiness Whiskey factory was converted into a high-rise loft condominium which became the centrepiece of the Mystic Pointe development. Etobicoke's first railway opened through the area in 1855, just north of the Lake Ontario shoreline, leading to the first period of growth as it replaced Dundas Street in Central Etobicoke as the main means of transportation and the industrial centre along its right-of-way. A residence in Humber Valley Village neighbourhood. Development in the Humber Valley Village began in the early 20th century. Central Etobicoke (Etobicoke Centre); the oldest communities in Etobicoke developed along the first street, Dundas Street, in the south of this area, which crosses the width of Etobicoke on the escarpment formed by the ancient shoreline of Lake Iroquois. This area centres around the Islington community, the former administrative centre of Etobicoke and later Etobicoke's 'downtown' which is near the central 'Six Points' intersection at its western boundary. The rural Richview community developed directly to the north of Islington in the 19th century on Eglinton Ave. (formerly Richview Rd. ), as did the gateway Humber Heights communities (connecting to Toronto): Westmount and Humbervale, to the east on Eglinton. Development of the until-then largely undeveloped eastern part of central Etobicoke (originally a forest reserved for the use of government mills as "The King's Mill Reserve"; "Kingsmill"), the "Humber Valley", was largely the work of Robert Home Smith starting about 1900 and including the communities of the Kingsway and Edenbridge. As Etobicoke developed in the post-war years, low-density residential areas filled in most of the rural areas between the old communities including Princess-Rosethorn and Eringate – Centennial – West Deane as well as the older Eatonville community to the west of Islington. Central Etobicoke includes Etobicoke's most exclusive neighbourhoods, with fine housing stock and many large treed properties. Along the East and West Mall parallel to Highway 427 exists a mix of hi-rise rentals, townhouses and post-war bungalows. Markland Wood is the farthest western community within Etobicoke/Toronto; situated along Bloor Street West, it is predominately single family housing with some mixed hi-rise rentals. Apartment buildings in Smithfield. Most neighbourhoods in North Etobicoke were built in the years following World War II. North Etobicoke; The 19th-century Etobicoke communities are Clairville, Highfield, Rexdale, Smithfield, Thistletown which grew along two formerly private roads (now Albion Rd. and Rexdale Blvd.) constructed diagonally across farms in Northern Etobicoke as a shortcut for travellers to Peel County (especially modern Brampton). First developed as an urban area by Rex Heslop in the post-World War II years around the new Rexdale (the Elms) community, northern Etobicoke now has many apartment buildings as well as a large 'skyway' industrial park to the west, developed after Malton Airport (in nearby Mississauga) became Toronto's main "Pearson International" Airport, and faces many of the problems associated with such areas. In 2016, according to Statistics Canada, Etobicoke was 56.9% White, 13.2% South Asian, 11.2% Black, 3.4% Latin American, 3.2% Filipino, 2.7% Chinese, 1.6% Arab, 1.4% Korean, 1.4% West Asian, 1.1% Southeast Asian, and 3.9% Other. The majority of Etobicoke's visible minorities, immigrants, and lower income population reside in North Etobicoke, with 62% of its population being foreign-born. Many people from India, Jamaica, Iraq, Guyana, Somalia, Ghana, Philippines, Nigeria, and Pakistan have all settled in North Etobicoke. The central and south end of Etobicoke has a large European population from countries such as Italy, Poland, and Ukraine, and also has some of the wealthiest neighbourhoods in Toronto, like The Kingsway. As of 2016, English was the most spoken language in Etobicoke, followed by (in order) Italian, Punjabi, Spanish, Polish, Ukrainian, Gujarati, and Portuguese. Islington–City Centre West is a commercial centre located in Etobicoke. Islington–City Centre West is one of several central business districts located outside of downtown Toronto. Pizza Pizza and Sunwing Airlines have their headquarters in Etobicoke. Skyservice and Canada 3000 had their headquarters in Etobicoke before the closure of these airlines. The construction industry in Etobicoke has been booming, with many new condominium towers being developed along the waterfront near Humber Bay and along Bloor street. This has helped increase Etobicoke's population after a short period of decline. The area's film and television industry is also promising. Etobicoke is home to a rib fest that is held every year on Canada Day long weekend at Centennial Park. The weekend is filled with entertainment, food, midway, and music. Humber College's is a public college that is located in Etobicoke. Four public school boards offer primary and secondary education for residents living in Etobicoke, Conseil scolaire catholique MonAvenir (CSCM), Conseil scolaire Viamonde (CSV), the Toronto Catholic District School Board (TCDSB), and the Toronto District School Board (TDSB). CSV and TDSB operate as secular public school boards, the former operating French first language institution, whereas the latter operated English first language institutions. The other two school boards, CSCM and TCDSB, operate as public separate school boards, the former operating French first language separate schools, the latter operating English first language separate schools. In addition to primary and secondary schools, two post-secondary institutions are located within Etobicoke. Humber College is a public college that operates two campuses in Etobicoke, the Humber North campus, and the Lakeshore campus. The University of Guelph-Humber is another post-secondary institution located in Etobicoke that is jointly operated by Humber College, and the University of Guelph, based in Guelph, Ontario. Guelph-Humber is not an independent degree-granting institution, with its degrees and diplomas issued from Humber College, or the University of Guelph. The Mastercard Centre is a ice hockey facility in Etobicoke, that is used as the home arena for the Toronto Furies, and as the practice facilities for the Toronto Maple Leafs. Etobicoke has a wide range of indoor and outdoor sporting leagues including baseball, soccer, football, hockey, and ringette. Some of the prominent clubs include the Etobicoke Kangaroos Australian rules football club, the Serbian White Eagles FC club, Toronto Croatia, and FC Ukraine United, which operate in the Canadian Soccer League, and the Toronto Furies of the Canadian Women's Hockey League. Southern Etobicoke is also home to the new MasterCard Centre, the home arena for the Toronto Furies, and the practice rink of the Toronto Maple Leafs. The Toronto Patriots of the Ontario Junior Hockey League are based out of Etobicoke. Etobicoke is the hometown of Major League Baseball Star Joey Votto as well as National Hockey League Star P. K. Subban, Connor Brown (ice hockey) of the Toronto Maple Leafs, and National Hockey League Hall of Famer Brendan Shanahan. Etobicoke is also home to Centennial Park which is a huge green space in west Toronto, and poses a great venue for soccer, basketball, skiing, hockey, basketball, hiking, track and field and also rugby. Etobicoke, Rexdale (North Etobicoke)is home to the top ranked high school basketball program in Canada, Henry Carr Crusaders. Producing notable US Division 1 and NBA players such as Tyler Ennis and Sim Bhullar. Henry Carr Crusaders were the 2016 AAA Provincial high school basketball champions. Several major expressways like 427, 401, 407, 27 and Gardiner Expressway are routed through the area, making it ideal for automobile-based transportation. There are numerous four- and six-lane thoroughfares in Etobicoke, laid out on a grid system. Many exceptions to Toronto's gridded street matrix are found in Etobicoke. A number of overpasses and awkward intersections, such as Bloor/Kipling/Dundas West (Six-Points), have been created in an effort to reconcile the grid with these planning anomalies. A Toronto Transit Commission streetcar at Long Branch Loop. 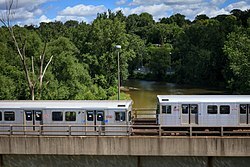 Public transportation is primarily provided by the Toronto Transit Commission's (TTC) bus, streetcar, and subway system. Line 2 Bloor-Danforth of the TTC subway system has its western terminus at Kipling, along with three other stations. Both Kipling and Islington stations are major transit hubs, with the latter serving as a terminal for MiWay bus services to Mississauga. Former transit expansion plans in Etobicoke, including the Eglinton West subway and the extension of Line 2 from Kipling to Square One Bus Terminal in Mississauga, were cancelled by previous provincial governments. Future transit expansion plans include two light rail transit projects, namely the Eglinton line extension from the future Mount Dennis station to Toronto Pearson International Airport and a new Finch West line between University of Guelph-Humber (Humber College North Campus) and Finch West station. Etobicoke is also home to four GO stations: Etobicoke North station on the Kitchener line, Kipling station on the Milton line, as well as Long Branch and Mimico stations on the Lakeshore West line. ^ "Etobian sets record straight". The Toronto Star. February 22, 2007. Retrieved August 19, 2015. ^ Mississaugas of the New Credit First Nation and Praxis Research Associates. Date unknown. The History of the Mississaugas of the New Credit First Nation. Hagersville, ON: Author. ^ Nichols, John D; Nyholm, Earl (1995). A Concise Dictionary of Minnesota Ojibwe. Minneapolis: University of Minnesota Press. ISBN 978-0-8166-2427-0. OCLC 31242698. ^ a b c d Willoughby, Paul. "A Brief History of Etobicoke". Archived from the original on March 24, 2012. Retrieved March 15, 2012. ^ "Fact Sheet - The Brant tract and the Toronto Purchase specific claims". Government of Canada. September 15, 2010. Archived from the original on April 15, 2013. Retrieved April 29, 2013. ^ a b "Early History". New Toronto Historical Society. Archived from the original on January 20, 2009. ^ a b Bob Given. "Beginnings!". Etobicoke Historical Society. Archived from the original on May 11, 2008. ^ a b "Etobicoke Records". City of Toronto. ^ a b Robert A Given. "Our Municipal Government". Etobicoke Historical Society. Archived from the original on October 10, 2007. ^ "Toronto Chronology". Archived from the original on September 29, 2007. ^ Secondary Schools: G to M « For King and Country. Torontofamilyhistory.org. Retrieved on July 26, 2013. ^ Roda McInnis. "The Toronto Amalgamation: Looking Back, Moving Ahead". Retrieved April 12, 2012. ^ "St. George's Golf and Country Club". January 28, 2007. Archived from the original on January 28, 2007. ^ "Census Profile, Etobicoke North, 2016 Census". Retrieved August 30, 2018. ^ "2016 Census Profile. Etobicoke Lakeshore. Statistics Canada". Retrieved August 30, 2018. ^ "Census Profile, Etobicoke Centre, 2016 Census". Retrieved August 30, 2018. ^ "Census Profile, Etobicoke Lakeshore, 2016 Census". Retrieved August 30, 2018. ^ "“FIAT” ONLINE CONTEST RULES & REGULATIONS[permanent dead link]." Pizza Pizza. Retrieved on December 5, 2012. "Pizza Pizza, 500 Kipling Avenue, Toronto, Ontario M8Z 5E5"
^ "skyservice.corporatebrochure.pdf." Skyservice. September 20, 2008. Retrieved on September 4, 2012. "SKYSERVICE AIRLINES 31 Fasken Drive, Etobicoke Ontario, Canada M9W 1K6"
^ World Business Directory: 1997. Company Listings : Afghanistan - Germany, Volume 1. Gale Research, 1996. 474. Retrieved from Google Books on February 13, 2011. "3000 Airlines Ltd. 27 Fasken Dr. Etobicoke, ON, Canada M9W 1K6" ISBN 0-8103-6189-2, ISBN 978-0-8103-6189-8. ^ "Canada 3000 Airlines Worldwide Offices". Canada 3000. January 18, 2001. Archived from the original on January 18, 2001. Retrieved May 20, 2009. "CANADA 3000 Airlines Limited Head Office 27 Fasken Drive Toronto, Ontario M9W 1K6"
^ Dotan, Hamutal. (November 28, 2012) Mr. Christie, the Ontario Food Terminal, and Development in Etobicoke | cityscape. Torontoist. Retrieved on 2013-07-26. ^ Cinespace Studios in Etobicoke (Kipling s of Norseman). Urbantoronto.ca. Retrieved on July 26, 2013. Wikimedia Commons has media related to Etobicoke.